In honor of Friday the 13th, we're showcasing a few infographics with great stats on the spooky day. Across the world, over 60 million people are affected by Friday the 13th; some of them won't go to work, drive cars, or get out of bed early on this day. The history of this day is unclear, but one theory asserts that 13 is an unlucky number because 12 is considered to be the number of divine organization - as reflected in the 12 months of the year, 12 hours of the day, the 12 signs of the zodiac, and the 12 apostles of Jesus. 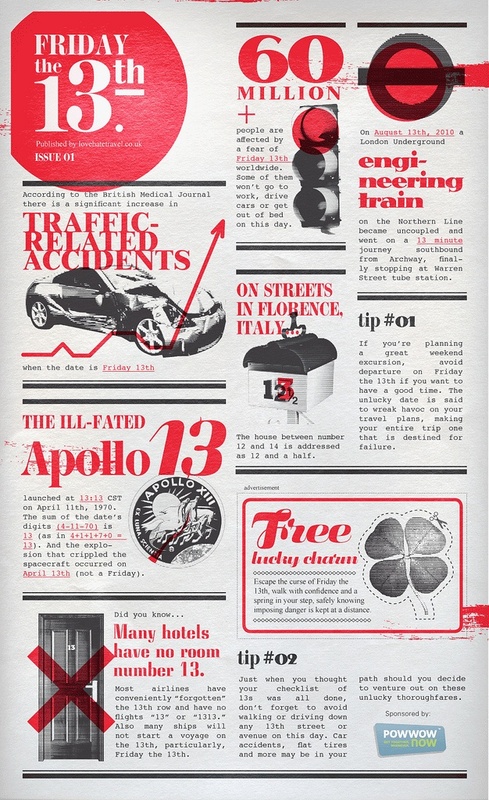 So whether you're superstitious or not, we hope you enjoy some of these fun infographics! According to the British Medical Journal, there is a significant increase in traffic-related accidents on Friday the 13th. Apollo 13 launched at 13:13 CST on April 11, 1970. The sum of the date's digits is 13, and the explosion that crippled the spacecraft happened on April 13 (although not a Friday). Many hotels do not have room number 13. Similarly, most airlines have conveniently no "flight 13" or row 13. Many ships will not set sail on Friday the 13th as well. There are 11 total movies in the Friday the 13th series. There is 1 death every 6 minutes and 4 seconds. Only 5 of the movies were actually released on Friday the 13th. In 1970 and oxygen tank exploded on board the Apollo 13 on Friday the 13th. In 1989 the stock market suffered a mini-crash, the second largest drop in market history. In 1996 rapper Tupac Shakur is pronounced dead after a fatal gunshot wound on Friday the 13th. The Liberty Tree in Magic Kingdom Park features 13 lanterns hanging from its branches, one for each of the original US thirteen colonies. "Alice in Wonderland" was Disney's 13th full-length animated feature film. One of the most famous rides in Disney, the Hollywood Tower of Terror drops guests 13 stories in the hotel elevator. Numbers like 13 and 666 have unlucky connotations in Western culture, but what about unlucky numbers in other parts of the world? Use this guide to navigate all the superstitious danger zones! No one really knows why the number 13 is considered unlucky. Possibly because of a Norse legend in which 12 gods sit down to a banquet, when the 13th uninvited god shows up, killing one of the other gods. Others believe that the number 13 is unlucky because of pagan traditions of observing a calendar of 13 lunar months per year.